We know it’s been a while since you came out of Infinity War kicking and screaming, but we still have a lot of feelings about it. Especially when it comes to Thor’s new eye. With our heads – mostly – cool, we sat down and discussed at length the latest film of the MCU, the theories for Infinity War II, and the future of Marvel. It’s a long one, but there was a lot to discuss. Because, again – the eye. Share your own thoughts on Infinity War and future Marvel films below! On the next episode: Most Anticipated Summer Blockbusters with special guest Katy Rochelle!! 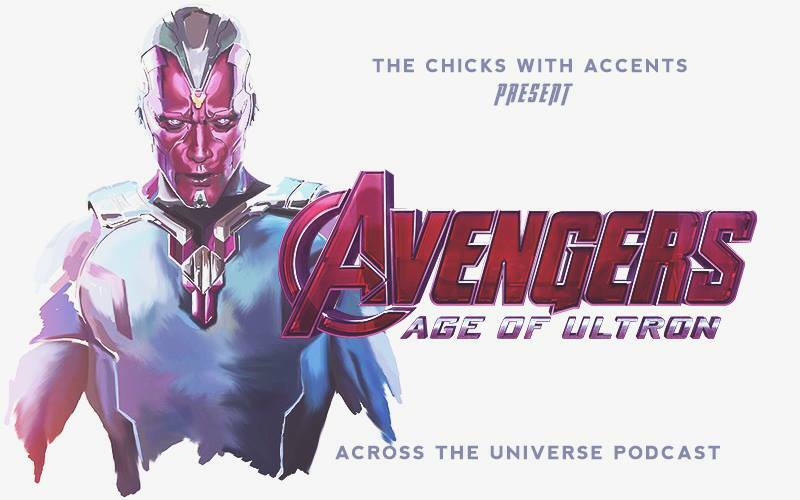 The chicks are back and this time they talk about the highly anticipated sequel to The Avengers– The Avengers: Age of Ultron. Listen and find out if they liked it, what they maybe didn’t like about it (caution: there are some spoilers) and other general thoughts. Give us your feedback on our facebook page, via email (acrosstheuniversepodcast @ gmail.com). You can find us on twitter under @Nikhat_Z, @filmflareblog and @mettekowalski. What did you think about The Avengers: Age of Ultron? Did you like it more than the first one? Did you find it sexist? Did you ogle at Chris Evans in that tight t-shirt (we know you did)?